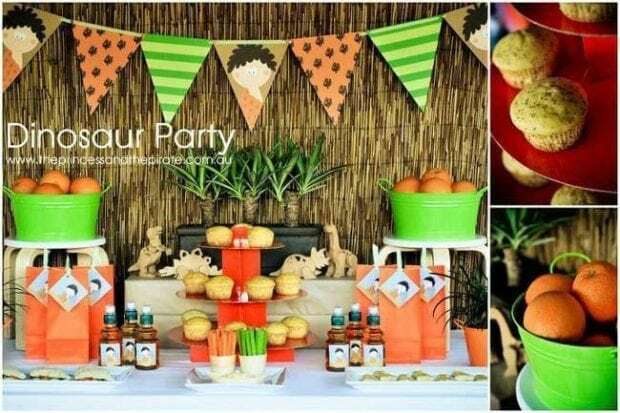 You’ll be channeling your inner caveman once you lay eyes on this awesome prehistoric dinosaur themed birthday party by Marissa of The Princess and the Pirate! 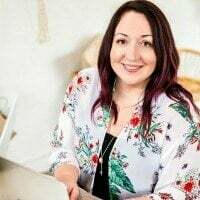 Styled to promote their printable dinosaur decorations, Marissa showcases two takes on the refreshment table—one full of dessert delights with cupcakes and candy galore and the other with more nutritious alternatives for the health-conscious. We think you’ll dig this Dinosaur 6th Birthday Party. 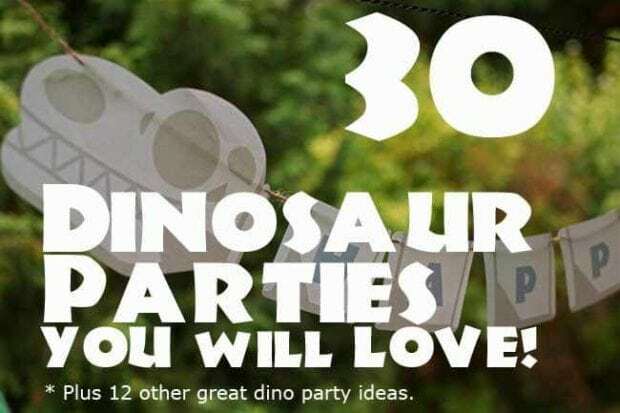 Dinosaur lovers will roar over these Outdoor Dinosaur Birthday Party Ideas. 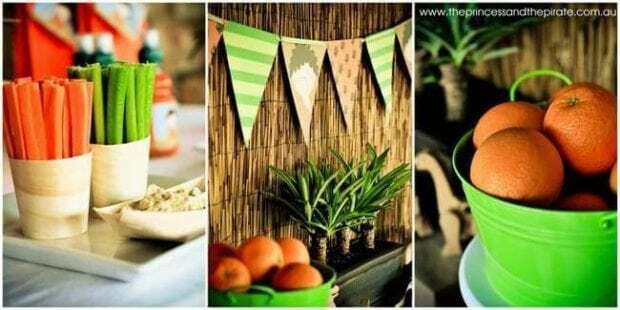 To set the stage for both refreshment table versions, bamboo fencing is used as a backdrop. I love the jungle feel it immediately establishes. These decorations would look great at a Jurassic World themed dinosaur party as well! Tropical plants and foliage are displayed in color coordinating pots. They add so much to the prehistoric jungle vibe. Wooden dinosaur models serve as perfect props. Guests love party favors so orange treat bags are neatly arranged atop the table. 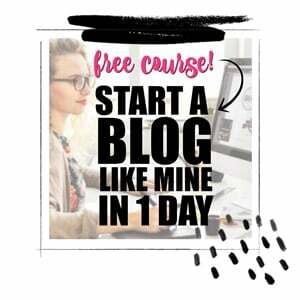 That sweet caveman shows up again on printable caveman tags. Take 1: The dessert table. This version of the refreshment table is filled with tantalizing treats. A tiered stand boasts yummy-looking cupcakes. Mini stools elevate jars full of candy. 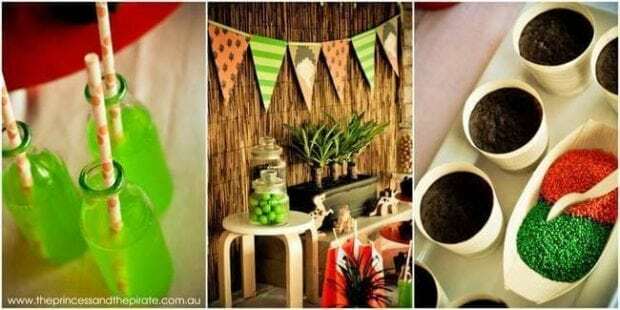 Sugary green drinks are served in glass bottles, made party ready with orange polka-dotted straws. White trays are lined up with amazing confections, ready for ravenous party goers to chomp. Take 2: The healthy refreshment station. A few things are swapped out to give party goers nutritious snack options. Muffins replace cupcakes on the tiered stand. Bright green buckets full of oranges take the place of the candy jars on the stools. Bottles of juice, dressed up in coordinating caveman labels, are swapped for the sugary beverages. Dinosaur-shaped, mini sandwiches and trays of veggies and dip replace the more decadent desserts. I love seeing this party theme celebrated in two equally awesome ways. Which would you go for–healthy snacks or sweet treats? Personally, I would love to see an equal mix! 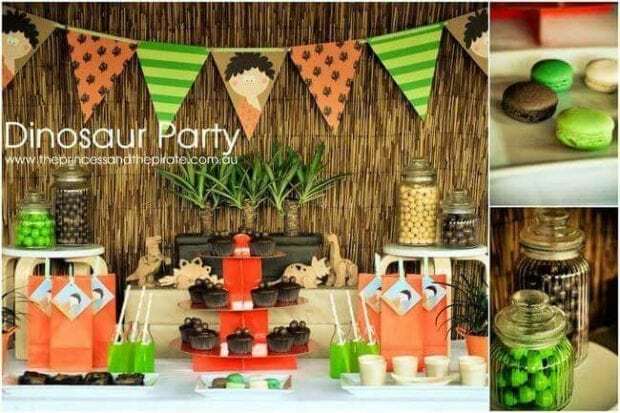 What fabulously creative ideas for celebrating a dinosaur-loving little boy’s birthday! 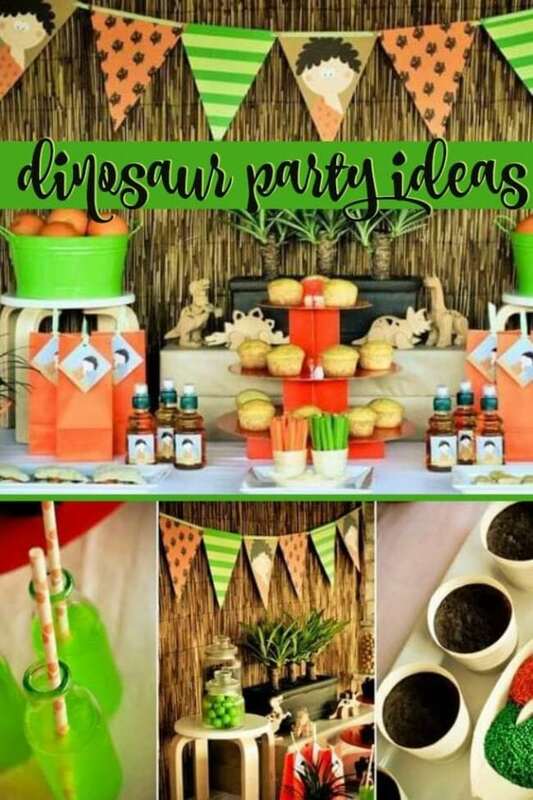 Be sure to check out more dinosaur birthday party ideas here.